Keep your hands safely away from hot sauces and stews with the proper mixing tool! 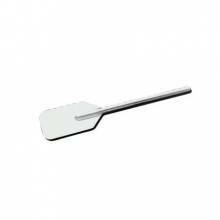 Opt for a stainless steel mixing paddle for your restaurant or commercial kitchen, as this durable item does not bend or chip with thick substances. Available in 4 different sizes, from 24” to 60”, you can be sure to find the proper size for even the biggest stockpot you use! Looking for a safe and quick way to cool your food? These Rapi-Kool Cold Paddles chill your soups, stews, sauces and more by cooling from the inside-out. Don’t risk time-temperature abuse and bacterial growth by waiting around for your products to cool on their own. Reusable, and easy to clean, these durable, food-safe plastic paddles are available in both 64 oz. and 128 oz. Clear up your stove space in a timely and efficient manner, by quickly cooling down unneeded food and sauces the proper way.